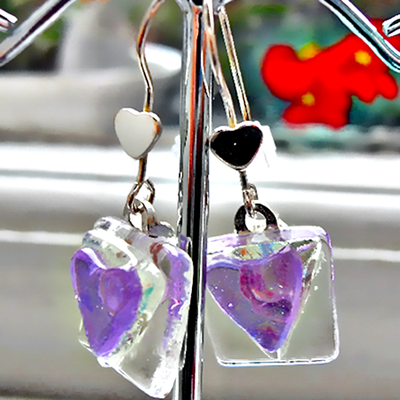 Pretty earrings with a clear base and a small rainbow effect Dichroic heart and then an even smaller Lilac heart on top. They have small Sterling Silver hearts attached to the earwires. They measure 1.3cm x 1.3cm and are made of three layers of glass. A clear base, then a small rainbow effect Dichroic heart, followed by an even smaller Lilac heart, all fused together. They have Sterling Silver earwires with small hearts attached.